I'm going through old pictures on my phone and I came across these. And since I shared one of our other walls this week, I figured, why not? Especially because this room is a direct result of that wall. Madelyn painted the walls pink in here too, so I had to paint over it. I told you no room was safe. I used Glidden Rich Navy and Behr Snowfall. This room is really bright or I wouldn't have attempted such a dark wall. I really love it though. Kinda fun and unexpected. Plus it's neutral enough to be a girl or a boy room. So here's the quick how-to: I painted snowfall on the base layer before I taped, let it dry, taped, then painted snowfall again along the tape edges so that the navy wouldn't bleed through when I pulled the tape off. Taping was a breeze. The greatest part about this style is that their's no rule as to where you actually have to place each line. 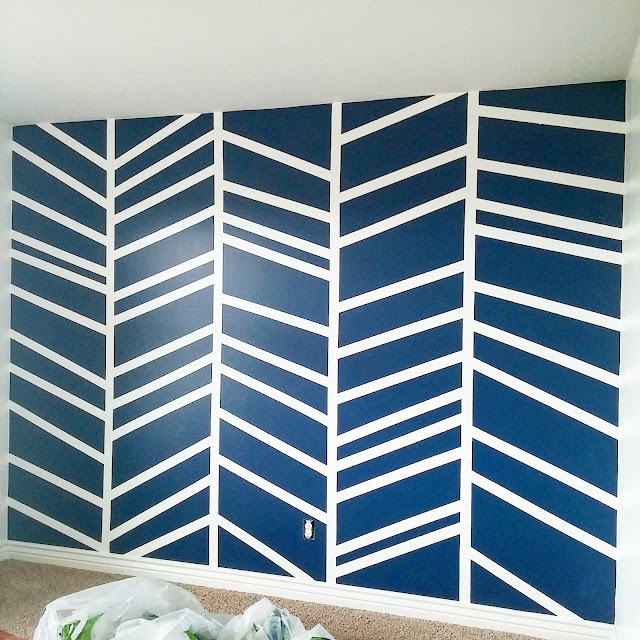 I measured how far the vertical lines would be but after that, I purposely made it random.Then I did 2 coats of navy, pulled off the tape and done. It's like the perfect lazy paint project. Guys, it's been 2 years. I'm ready to share. The trauma. The horror of it all. I wouldn't share except for the fact that this triangle wall gets so many comments and emails. But if you knew how much stress this wall caused me, the wrinkles it created, you probably wouldn't ask. Let me clarify. It was not the actual painting, not the actual wall that was the downfall. Just what came afterward. So don't be scared about doing a triangle wall. That part is actually quite fun. Just avoid the pitfalls. Those pitfalls being a 2 year old, a brand new basement, and some paint. Do you see where I'm heading with this? It was a bright and sunny day in August 2014. Jonathon had just finished the basement a month before to accommodate our growing family. We'd just had little Sophia. She was a good, sleeping baby and so I thought "Let's paint the wall today." Lila and I had the colors and supplies picked out for months, just hadn't found the time or energy. But that day, that fateful day, was the day. We started by taping. I actually did a small little sample design first out of the paint samples on an 8.5 x 11 paper, so that I could get a sense of what things would look like. I decided to make the bottom of the triangles 2 feet and the sides 1 foot. We taped. It took a while, wasn't perfect, but oh well. Based on my smaller design, I labeled which triangles would be painted which colors. So far so good. I used Behr Swiss Coffee as the paint on the bottom layer and the rest of the walls. So I busted some of that out to paint on the lines of the tape. 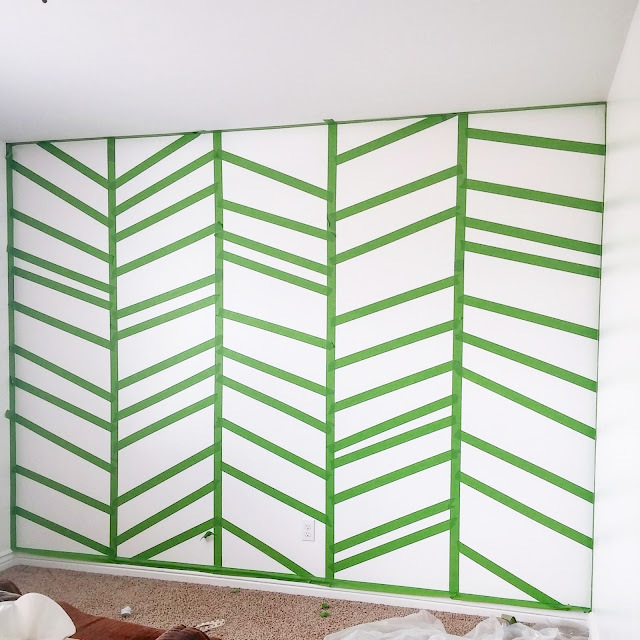 You do this on tape lines so that the next colored layer isn't as likely to bleed through. Our walls our plastered "Santa Fe" style , so they don't have a lot of bumps either. That helps too. I purchased paint samples in 6 different colors. Lila picked the colors. Obvs. Romantic Morn was the only one I really cared for. We set to work. Look at how little she was! We painted all the triangles according to the color I'd written. Eventually we added the other colors. This is after a first coat. Second coat and I did a 3rd coat (not pictured), just in case. This is a basement room, so we were working around air ducts. And look at tiny, chubby little Ezra! After we let it dry for a bit, we pulled off the tape. And viola. Some of the triangles were a little wonky and I can't say it was particular style, but oh well, Lila was so tickled. And then. Like an idiot, I closed the paint samples and put them in the windowsill. Right where 2 year old Madelyn had access. While I went upstairs to feed Sophia, Madelyn quietly dumped paint out all over herself, the brand new carpet, the freshly painted walls in our basement, then upstairs. Almost every wall had her hand print on it. When I saw her 20 minutes later, I just couldn't even. I stuck her in the tub, cried, scrubbed everything, cried, and cried some more. My hands were raw from scrubbing out paint. Jonathon even came home early from work to help me. I'm such a baby. My biggest take away of the day was lock up the paint and be proud of yourself that you didn't hurt your child. You know what though? Life went on. Madelyn is almost 4 now and we've almost survived her toddlerhood. Most of the pink paint is gone now. We either scrubbed it out or painted over it. The paint that remains is bearable. But sometimes when I come into this room and see the triangles, my heart just wishes that I'd done boring old gray. So go, make your triangle wall, just keep it away from your toddler guys. Far away. I'd be lying if I said Day 5 wasn't my favorite. And my kids' favorite. Because it's all about Jackson Pollock. So naturally, it's messy. And my kids love to be messy. I showed the kids some of Jackson Pollock's art and pictures of him actually painting. They thought it was so cool. I actually have to commend the kids for being able to see more than just splatterings of paint on a canvas. As they looked, they all pointed out things that they could see. Tree's, birds, star wars ships (of course), a windy day, flowers, the list was endless. Then I laid down a large roll of paper. This is a purchase that I highly recommend, my kids love coloring or painting on a big piece of paper. If you don't have one however, just use whatever paper you've got. I dumped out the paint and let them loose. Here they are all set, wearing grocery bags. My feeble attempt at keeping them clean. They started timidly at first. But they got over their trepidation quickly. And they were delighted by their messiness. By the end, everything was covered in paint. The best part about art week is seeing my kids completely happy with what they have made. Mary Cassatt is one of my favorite artists. I love how she captured moments of everyday life. Not only was she one of the first female artists who really made a name for herself, I feel like she excelled at creating moments. Especially with mothers and their children. Obviously, motherhood is something that is so special to me and as a child, when I looked at Mary Cassatts' mother/child paintings, they shaped a lot of my hopes and ideals of what motherhood might be like if I was lucky enough to become one someday. As a mom, I love to capture moments. Not that I'm claiming to be as good as a famous artist, obvs. I'm not a professional photographer. I'm not even an amateur. I really have no interest to be. My happiness is just in snapping a quick pic or video that is going to save a memory for me. I think that's why impressionism is my favorite art period. The fuzzy pictures always make me think that the artist was capturing a moment and were somehow able to share it with the haze of memory on the canvas. Anyway, I'm rambling. After I explained that to the kids, they were bouncing off the walls because they really didn't care and they just wanted to paint. :) So I let the kids choose a picture that they liked and then paint their interpretation of it. I kind of loved the results. Especially Ezra's. Here we are at Day 3! 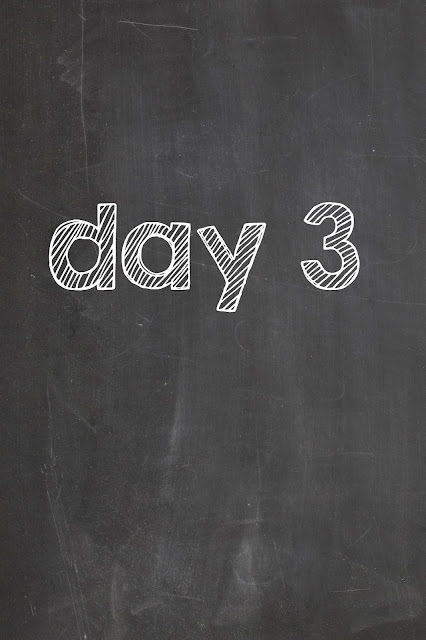 I'll be honest, by Day 3 I'm pretty tired. Working around twins for artweek has been a little tiring. And although we've definitely scaled back compared to last year I still have to make adjustments as we go through the week. I'd planned on taking the kids to the park to draw, but it just didn't end up happening. And that's just fine. We ended up talking about self-portraits, or speaking in a language my kids could understand, "the original selfies." I focused on the artist Rembrandt, specifically his self portraits. The giggling that went on during this process was hilarious. And for good reason. These kids are such little hams. Art week Day 2 is all about sculpting! I focused on the artist Michelangelo and some of his famous sculptures. We googled his statue David. I kinda focused on the face, not trying to be overly restrictive, but my kids are little I didn't really wanna be too free and easy. Besides, they were fascinated with just the face anyway. They thought it was so cool that someone could chisel or sculpt something out of nothing. Then we tried our hand at our own sculpting. We used some Crayola Air Dry Clay (pictured above) but honestly, play-doh (homemade or store bought) would have worked just as well. In fact, if you have really young kids, play-doh would be preferable because this clay was a little difficult to work with. Even my 6-year-old struggled a little. But in a way, it was good to give them an idea of how difficult sculpting must have been for Renaissance artists. The end result was not necessarily picture worthy, but the kids were so proud of their little sculptures! Lila and Ezra made little flower pots, and Madelyn mostly made snowmen. And I'll be honest, this clay and play-doh in general, are quite messy and require a litle of cleaning up by yours truly afterwards, but I think it's worth it. What matters is that we had fun and learned a little on the way! At the beginning of art week, we always try to start with the basics at the very beginning. Tell me you're not singing "a very good place to start" right now? :) So Day 1 is all about the stone age. I mean literally, go grab some stones (and some paint). We literally live in an old river bed, so rocks are like weeds around here. I just had the kids go gather rocks from the garden and wash them off. If you don't have rocks in abundance, just use paper, wood, or whatever you have on hand! We talked about cave paintings (like last year) and I also tied in how pretty God has made the Earth already and that art can often enhance Gods creations. (If you're not religious, feel free to skip this.) Instead of using chalk, I let the kids make their own "rock designs." Painting is usually a favorite with my kids and they took this job very seriously. In the end, the kids were delighted with their "modern" cave/rock paintings. It's always fun to see how something so simple can make kids happy! See you tomorrow for Day 2--it's gonna get messy!